If it wasn’t for Blitzprint, my home writing business would never have gotten off the ground. After they printed my book, I sold 500 copies within a matter of months. Four years later, Mid-Air Moose Jaw is still doing well on the market. Blitzprint has made the difference with their quality printing—and by always treating me not just like a customer but also a friend. 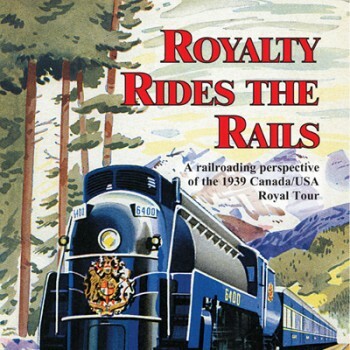 Royalty Rides The Rails is the first railroad book written covering the highly successful 1939 Royal Tour of Canada. Their Majesties crossed Canada from Quebec to BC via a specially modified 12 car blue and silver train, that was clearly a palace on wheels. Returning from BC to Ontario the royal train took a jaunt into the USA before returning to Canada and Halifax, its final destination. The author has captured a blend of the technical aspects of the train with the interpersonal, in a mix of train consist data and never before seen or heard interviews with staff who worked on or about this special train. This personable touch makes for enjoyable reading and also a good source of reference for the history buff. Printed in soft cover, 8.5 x 11, this 200 page collectable has 138 black and white photos along with 38 rarely seen colour photos. No other event in Canadian history has surpassed the positive public response of the 1939 Royal Tour. A Saskatchewan prairie boy from birth, Larry Shaak enjoys all things historically Canadian. His love for history and people comes out clearly in his latest books Royalty Rides The Rails and Mid-Air Moose Jaw. Readers enjoy the personal touch he has adapted in his historical writing. “I was bored with history books in school because they lacked the human element,” says Larry. Larry’s writing draws on his strong work ethic and vast experience. He considers himself fortunate to have worked as a railway station agent, highway patrolman and adult educator. After an early retirement, Larry went on to write, raise St. Bernard dogs, drive combination semi-trailer units, and achieve his ultimate career goal of becoming a locomotive engineer. Larry’s love for writing started as student in a creative writing class which led him to completing both his BA and BEAD degrees. His love for drama came from his mother who, as a country school teacher, staged packed-house Christmas concerts that stayed forever fondly etched in his memory. As an adult educator, Larry started an after-school drama club, writing and directing plays for the participants. He went on to write and direct for a dinner theatre group, and then launched a home writing business. He credits his education, experience—and Blitzprint—for his self-publishing success. Larry’s next book, scheduled for release in late spring 2011, will be a collection of personal short stories about growing up in a small town, the many people he has met, his various occupations and his many travel adventures.